5774 A new year. In case you haven’t noticed…the world is changing. The future is unpredictable. Like a wind storm moving things helter-skelter, we never know where things will end up. The past, on the other hand, is well-known and stable. The values, traditions and perspectives of our parents, grandparents and ancestors do not change. We may cherish the past or we may discard it. You get to choose. Ask yourself, “What happens to the past when you are no longer around to remember it?” Does it disappear? Or does it remain as a treasure trove of discovery for future generations? 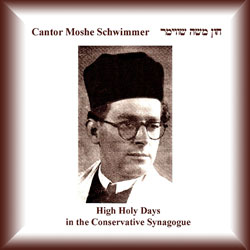 High Holy Days in the Conservative Synagogue sung by Cantor Moshe Schwimmer is just one example of how the Judaica Sound Archives attempts to bring the unique qualities of early 20th century European liturgical music into the present. And, hopefully, the future. This wonderful recording was created by the JSA from the private recordings of Cantor Moshe Schwimmer and can only be heard on this website. Moshe Schwimmer was a cantor whose beautiful voice and soulful singing touched audiences for decades. Yet, his voice might have been lost forever were it not for one man’s strong desire to cherish his brother’s memory and protect his legacy. The Judaica Sound Archives is proud of its role in the preservation of Jewish culture. We believe that by bringing the unique qualities of early 20th century European liturgical music into the present we contribute to its survival into the future. If you enjoyed this blog post be sure to like us on Facebook.